Goal, goal, goal, goal. You already got tired of reading goal four times. Well Sporting S.C. striker Abdoulaye ‘Abdul’ Ibrahim didn’t get tired after scoring four goals versus F.C. Spring Valley in the second division but found the net seven times against them in a 15-1 win on Nov. 18th. Abdul now holds the record for the most goal scored in a single game for 16-year-old club Sporting in his third year with them. As expected the Togolese was in great spirits after his seven-goal display. “Every player would be happy, you know. It’s normal after you played good, you scored goals, of course you’re going to be happy,” he said. Not any player can score seven goals in a CSL D2 game—or even a hat trick—there has to be something special about you. Abdul played in the top division in the U.S. with New York Red Bulls in 2005 (when they were known as the Metrostars) and with Toronto F.C. in 2007. 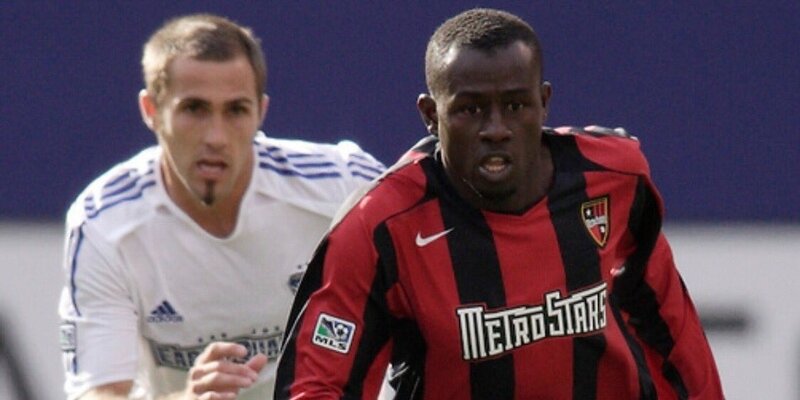 Sporting S.C. striker Abdoulaye 'Abdul' Ibrahim in his time with the Metrostars (now known as New York Red Bulls). Abdul explained that after playing as high as in the MLS, it makes sense for him to rack stellar performances in a lower division. “I have more experience, I was playing at a higher division so that helped me a lot. It’s not too competitive for me because I was playing at a higher level than this league,” the 32-year-old said. Abdul is the current top scorer and the seventh leading assistman of the second division, tallying 11 goals and four goal-passes in six outings. The striker’s goal and assist contribution helped SSC to a 4-2-2 record, which places them in third spot. Sporting is one of the most improved side this season after Abdul’s return, who was nursing an injury last year. He had a hand in 48 percent of SSC's goals so far this campaign. The club won as many games as they won now, four, during the entire 2017-18 season and finished fifth spot lower than where they are now: eighth place. Abdul recognizes the team’s transformation from last season, in fact perhaps he would bet his favorite pair of boots that this year’s Sporting team is a promising side. “Believe me, right now we have a good team and we’re going to do something with that by the end of the season. I hope everything works out for us the way we want,” he said. If Sporting climbs up to first place at the end of the season, the club will play in the top flight of the CSL next campaign for the first time in their history and Abdul could test his ex-MLS player talent versus the nine former MLSers of the first division. As for his individual goal, the former Toronto player dreams of winning the Golden Boot award after the end of the season. “Scoring is not something easy so I’m happy I’m the topscorer now. I’m going to push until the end of the season. I’m going to try to do my best to be the topscorer of the season,” the forward said. The players closest to Abdul now in the Golden Boot race are Yankuba Janneh (KidSuper Samba A.C.) and Marco Charnas (Manhattan Celtic) with nine goals. The veteran striker’s next game with Sporting is a massive fixture against second placed and former D1 side Manhattan Celtic on Dec. 9th away from home at Randall’s Island Field 75 at 2:00 p.m.
Celtic is the best defensive team of the North Region, conceding 11 goals in eight matches.